Vets in Germany have fitted Schildi the tortoise with a Lego Wheel after he was found abandoned with a heavily damaged leg. After nursing him back to health and amputating the leg, vets experimented with different designs before settling on the one you see here. 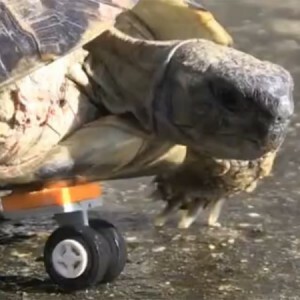 Dr Panagiotis Azmanis said they originally fitted a double wheel but this made it difficult for the tortoise to turn corners, so a single wheel was used. If Schildi gets a flat tyre it is a simple procedure to change it for a new one. Dr Azmanis went on to say that they expect to see Schildi once a year for an annual service.